Join us to bring in the 2019 in style . 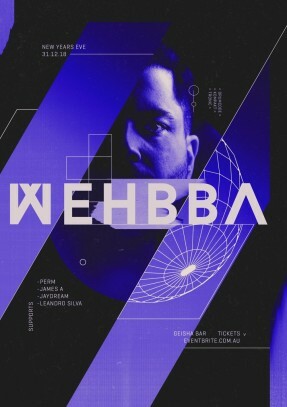 New Years 2019 with special guest Wehbba (Drumcode). Early Bird Tickets include an hour drinks package. Bottled beers (not on tap). Selection includes: Heineken, Tiger, Asahi, Peroni, Rogers, Corona, Five am Brew Dogs St, Sierra Nevada, Stone & Wood, Estrella, Mountain Goat Steamed Ale, Sam Adams Boston Lager. Ferral Smoke Porter, Ferral Hop Hog. Wehbba is considered one of the premiere electronic music producers hailing from Brazil, gracing the industry’s most respected labels and parties across the globe. His early years of spinning techno and house lead him to his first international recognition in 2006 on German imprint Killa Beat. Since relocating to Barcelona in 2015, and immersing himself into the European scene he has seen a steady stream of outstanding EP’s on labels including Drumcode, Soma, Bedrock, 2020Vision, Knee Deep In Sound and Tronic. His versatility and diversity secured him a feature on “The Magnificent Seven” movie promotion with Sony Pictures, remixing the motion picture’s soundtrack, as well as remixes and productions with some of the worlds most respected artists including Laurent Garnier, Danny Tenaglia and John Digweed. After his four track EP on ‘Eclipse’ on Drumcode stormed into the Top 10 within a few days in February, it will come as no surprise that he has already released his second EP ‘Catarse’ in July which also dominated the charts, along with playing their Off Sonar Week showcase in Barcelona and Resistance in Ibiza and upcoming Warehouse Project in November.